Map of Cisalpine Gaul, extending from Veneto on the Adriatic, to Pisa and Nice on the Mediterranean, to Lake Geneva in the west, and the Alps in the North, from Abraham Ortelius' Theatrum Orbis Terrarum, the first modern atlas of the world. Antwerp, 1608. 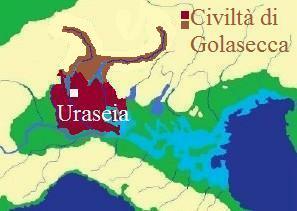 Cisalpine Gaul (Latin: Gallia Cisalpina, also called Gallia Citerior or Gallia Togata) was the part of Italy inhabited by Celts (Gauls) during the 4th and 3rd centuries BC. Conquered by the Roman Republic in the 220s BC, it was a Roman province from c. 81 BC until 42 BC, when it was merged into Roman Italy. Until that time, it was considered part of Gaul, precisely that part of Gaul on the "hither side of the Alps" (from the perspective of the Romans), as opposed to Transalpine Gaul ("on the far side of the Alps"). The Canegrate culture (13th century BC) may represent the first migratory wave of the proto-Celtic population from the northwest part of the Alps that, through the Alpine passes, penetrated and settled in the western Po valley between Lake Maggiore and Lake Como (Scamozzina culture). They brought a new funerary practice—cremation—which supplanted inhumation. It has also been proposed that a more ancient proto-Celtic presence can be traced back to the beginning of the Middle Bronze Age (16th-15th century BC), when North Western Italy appears closely linked regarding the production of bronze artifacts, including ornaments, to the western groups of the Tumulus culture (Central Europe, 1600 BC - 1200 BC). The bearers of the Canegrate culture maintained its homogeneity for only a century, after which it melded with the Ligurian aboriginal populations and with this union gave rise to a new phase called the Golasecca culture, which is nowadays identified with the Celtic Lepontii. Livy (v. 34) has the Bituriges, Arverni, Senones, Aedui, Ambarri, Carnutes, and Aulerci led by Bellovesus, arrive in northern Italy during the reign of Tarquinius Priscus (7th-6th century BC), occupying the area between Milan and Cremona. 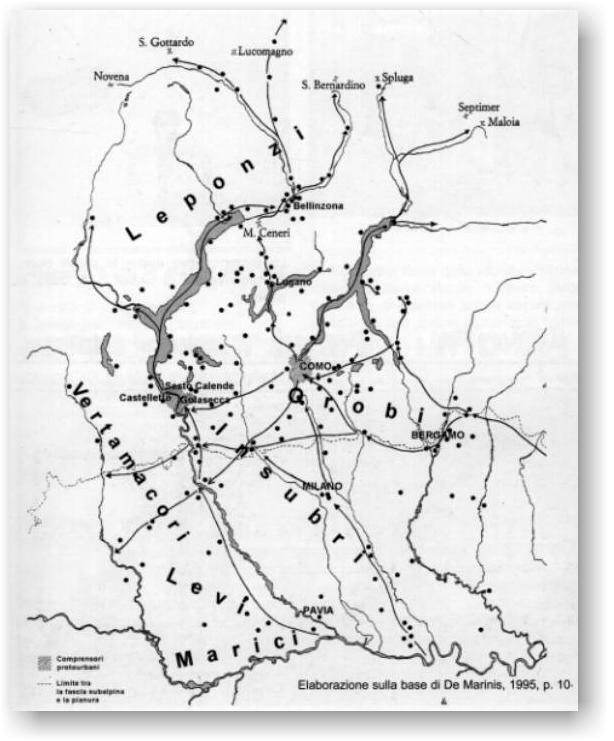 Milan (Mediolanum) itself is presumably a Gaulish foundation of the early 6th century BC, its name having a Celtic etymology of "[city] in the middle of the [Padanic] plain". Polybius in the 2nd century BC wrote about co-existence of the Celts in northern Italy with Etruscan nations in the period before the Sack of Rome in 390 BC. The Veneti were an Indo-European people who inhabited north-eastern Italy, in an area corresponding to the modern-day region of the Veneto, Friuli, and Trentino. By the 4th century BC the Veneti had been so Celticized that Polybius wrote that the Veneti of the 2nd century BC were identical to the Gauls except for language. The Greek historian Strabo (64 BC–AD 24), on the other hand, conjectured that the Adriatic Veneti were descendant from Celts who in turn were related to later Celtic tribe of the same name who lived on the Armorican coast and fought against Julius Caesar. He further suggested that the identification of the Adriatic Veneti with the Paphlagonian Enetoi led by Antenor — which he attributes to Sophocles (496–406 BC) — was a mistake due to the similarity of the names. The Canegrate culture testifies to the arrival of Urnfield migratory wave of populations from the northwest part of the Alps that, crossing the alpine passes, had yet infiltrated and settled down in the western Po area between Lake Maggiore and the Lake of Como (see: Scamozzina culture). They were bearers of a new funerary practice, which supplanted the old culture of inhumation instead introducing cremation. ^ Cassius Dio XLI, 36. ^ Kruta, Venceslas (1991). The Celts. Thames and Hudson. pp. 52–56. ^ Stifter, David (2008). Old Celtic Languages (PDF). pp. 24–37. ^ Hazlitt, William. The Classical Gazetteer (1851), p. 297. ^ Boardman, John (1988). The Cambridge ancient history: Persia, Greece and the Western Mediterranean c. 525-479 BC. p. 716. ^ History of the Roman World: 753 to 146 BC by H. H. Scullard,2002, page 16: "... of healing. In the fourth century their culture became so Celticized that Polybius described the second-century Veneti as practically in- distinguishable ..."
^ Strabo, Geography, Book IV, Chapter 4: "It is these Veneti [the Gallic tribe of the Belgae], I think, who settled the colony that is on the Adriatic (for about all the Celti that are in Italy migrated from the transalpine land, just as did the Boii and Senones), although, on account of the likeness of name, people call them Paphlagonians. I do not speak positively, however, for with reference to such matters probability suffices." Book V, Chapter 1: "Concerning the Heneti there are two different accounts: Some say that the Heneti too are colonists of those Celti of like name who live on the ocean-coast; while others say that certain of the Heneti of Paphlagonia escaped hither with Antenor from the Trojan war, and, as testimony in this, adduce their devotion to the breeding of horses — a devotion which now, indeed, has wholly disappeared, although formerly it was prized among them, from the fact of their ancient rivalry in the matter of producing mares for mule-breeding." Book 13, Chapter 1: "At any rate, Sophocles says that [...] Antenor and his children safely escaped to Thrace with the survivors of the Heneti, and from there got across to the Adriatic Henetice, as it is called." ^ The Dawn of the Roman Empire, by Livy, John Yardley, Waldemar Heckel. ^ "Museo del monastero di Santa Giulia in Brescia". Santagiulia.info. Retrieved 2011-09-16. Smith, William, ed. (1854). "Gallia Cisalpina". Dictionary of Greek and Roman Geography. London: Walton and Maberly.